Not much to report here today, but to save me from just throwing up my MMM pics, I have a little bit of rumination. About self-stitched clothing, their wearing, and pushing the bounds of fashion. All of which is to say, my outfit today felt a little… odd. Not quite outlandish (though maybe close). But just a little… too… different. Now, either element, the 70s Dress and the Kimono Lady Grey, I’ve worn on their own without issue. But the dress is a bit over-the-top for the work day, not too mention too low cut for this weather, so I felt like a sweater over top would be the perfect thing to dress it down. 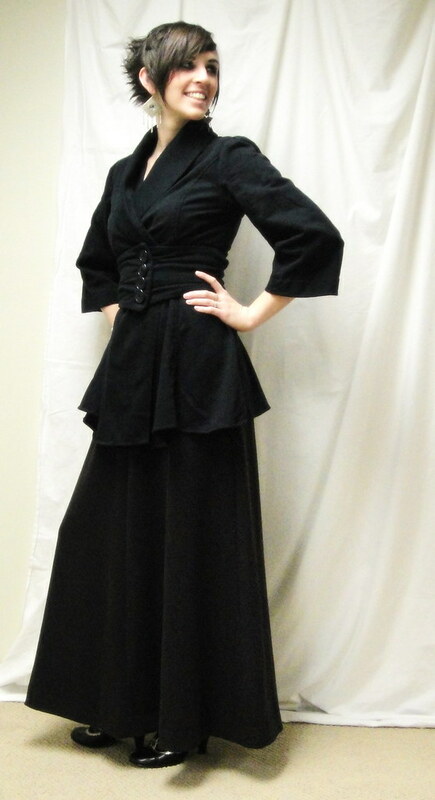 The best look overall would be the 50s shrug, as I’ve shown before, but a) this is still pretty fancy, and b) it still leaves a pretty large chunk of cleavage getting COLD. The cardi-wrap would probably work stylistically as well, but despite stubbornly photographing as black the 70s dress is actually a distinct, if muted, purple in real life. Which I don’t think goes very well with the red wrap. Especially when I’m trying to look less odd. actually really like the look—elegant, full, lots of fabric swishing around… but it’s a bit, hmm, not exactly over the top, but maybe off to the side. Beyond the bounds of “everyday” fashion. I feel like there’s an equation going on here, where rather balancing the oddity of either sweater or dress with ordinary jeans or a cardigan, I added two slightly odd pieces together and got something just a little too far past normal. So why did I pick this outfit? It’s not like I don’t have plenty of self-stitched jeans that go just fine with the sweater. But I really wanted to wear the dress, I guess. Part of the point of the me-made months is to try wearing the things that feel just a little bit odd. Just to see, I guess, how odd odd really is. I don’t have as much trouble with this as a lot of self-stitched sewists, I think because so much of what I’ve made has been very tightly contemporary (as opposed to flights-of-fancy dresses and vintage concoctions). But I really do want to do some wearing of my flights of fancy, as well as my regular threads. So this was a stab at that. You look really tall in that outfit! I quite like the look, and the idea of fabric swishing around when you walk. Dramatic, for sure! I think you look fabulously elegant, but perhaps as you say, a bit off to the side for day wear, perhaps a pencil skirt would be more the thing. I actually love it. When I lived in Austin, it would not have been over that line at all, which is an academic town, but sort of crossed with San Francisco in it’s weirdness. Of course, here in Texas it would be too hot for that outfit most of the year as we have been having highs in the 80s this week (mid to high 20s Celsius). You look great! I’d wear that look any day! But then, I’m also weird, also in academia, and that is an odd place that allows for a lot of personal quirks. Furthermore, I love seeing other people dressed up for everyday, people who dare to push the boundaries of the ubiquitous jeans&sneakers uniform and who don’t care what others might think, because really, the usually don’t think at all. So, more power to you for going to work like this. I have never worried… scratch that. I DECIDED not to care what people thought about what I wear. My cowokers have become accustomed to it and even some of them have put more effort into ‘dressing up’. We’re corporate casual but I’ve turned it into “corporate eccentric”. It may be a bit Victorian, but you look beautiful in it. I don’t think this looks notably odd, I think it just looks very different from your usual everyday wear. That kind of thing always makes me feel slightly uncomfortable too (presumably for no good reason in this case- as you said, no one was pointing and laughing, right?) If you wore long skirts and funky tops all the time, you’d probably feel really off if you suddenly wore skinny jeans and a blouse. Just love the look! I wish I wasn’t just a stay-at-home mom so I could bother with clothes! Not odd. Perhaps a little dressy, but that’s not necessarily a bad thing. The 70s dress reads as a gored skirt here, which could be a staple for some. So definitely not odd.